Deadline extended for summer internships! The deadline for students to apply for internships is just 2 days away! Send your resume and cover letter to Ms. Morse today or tomorrow! This Friday, we our hosting our first-ever career speakers’ workshop! Students can sign up now to hear from 2 of the following professionals:a Kinecta Credit Union vice-president; a senior mechanical engineer for Northrop Grumman; a public relations director for the LA Galaxy; a volunteer coordinator at the Roundhouse Aquarium; a senior administrator at Fox Networks; and a Marketing Director at 530medialabs. Signups are on a first-come, first-serve basis! Here is the student sign up form: https://docs.google.com/forms/d/1u5UbxISzo0h8gXJoqBSEJQeezCXemDZVTnVLpHDXNFE/viewform. Students will be able to see 2 speakers, each for 25 minutes. Here is a google doc with speaker bios for students to review prior to signing up: https://docs.google.com/document/d/1YPeOw558LxbXyglJrmXXlIAs86V7E4a6ngkmDFkz7aU/edit?usp=sharing. Students, come Friday at 9:00 and take advantage of this terrific opportunity to learn more about some of these careers! Also, TODAY is the deadline to apply for a summer internship through the Da Vinci Schools Real World Learning website at www.dvrealworldlearning.com. Students can search for internships that suit their interests, and send a resume and cover letter outlining their skills and qualifications for the position to Natasha Morse at nmorse@davincischools.org by the end of the day! Develop your resume, college application, and real world skills through a summer internship! Apply for a summer internship through the Da Vinci Schools Real World Learning website at www.dvrealworldlearning.com. 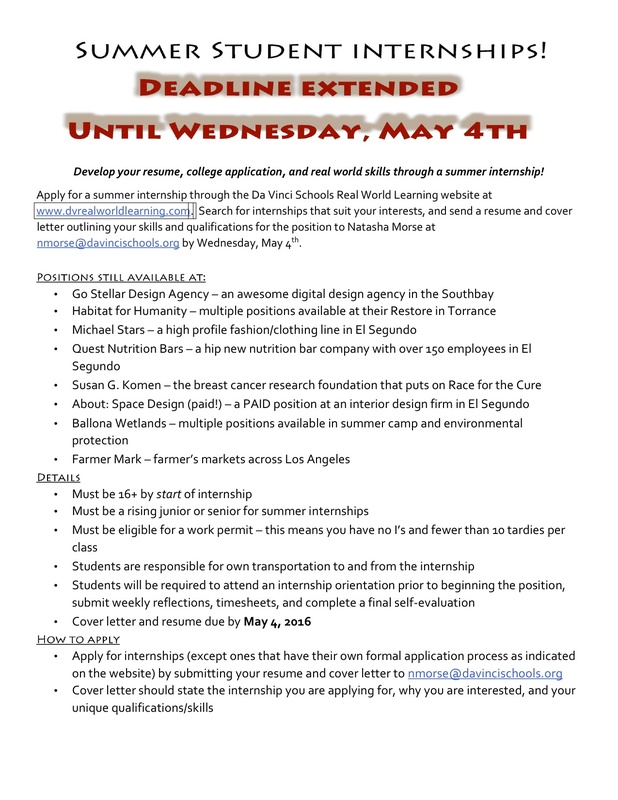 Search for internships that suit your interests, and send a resume and cover letter outlining your skills and qualifications for the position to Natasha Morse at nmorse@davincischools.org by April 22nd 2016. Chevron, Belkin, Northrop and Kinecta challenged Da Vinci Schools to raise $50,000 — and WE DID IT! Thanks to your amazing support, we raised more than double our goal. Combined with the generous corporate gifts, a total of $150,575.82 in gifts and pledges was raised for our Da Vinci students! There is still time to make a tax-deductible gift or pledge! You can drop a check off at your school office, or give or pledge online at www.davincischools.org/makeagift.shtml. All pledges must be paid in full by June 1, 2016 to be eligible for the match. Please fulfill your pledges today at the web address above. We thank you!! Thanks to our fabulous calculus teacher and alumni coordinator Katie Kondo, we now have this fantastic resource: a compilation of data and insights from DVS alumni currently attending UC and CSU schools on the universities they are currently attending. I encourage you to take the time to read through this and see what DVS students have to say about each one! Yesterday, Monday, April 11, 2016 a female student from Dana Middle School was walking home on La Cienega near 137th St. A car was parked along the street and a number of men inside the vehicle started to tease the student and encourage her to approach the car. She did not stop, but rather proceeded home. A statement from the victim indicated that the suspects were white males wearing all black and around 6 feet tall. No further information was obtained. Thankfully, the student made it home safely, but as always in times like this we like to revisit some very important safety procedures for those of our students that walk home or in the neighborhood. We strongly suggest that all students walk with a buddy and that routes home mainly stick to highly traveled streets. As a parent/guardian, we suggest that you review all walking routes with you children so you also know the path they take home. Further, students should always be aware of their surroundings and should refrain from wearing headphones in both ears as that limits one’s ability to be fully aware. Most importantly, please let all your children know that if they see something, they should say something. We can always help support students in situations like these and have always worked closely with the Hawthorne Police Department and the Los Angeles County Sheriff Department. We ask that you take some time to review these safety procedures and if you have any information regarding this incident or come across anything in the future please let us know. Summer Student Internships – it’s time to apply now! Cal Poly EPIC Summer Camp Deadline is coming up! Next Friday is the deadline to register for Cal Poly’s EPIC Summer Camp. This is a fantastic opportunity for kids to live on campus for a whole week and participate in engineering activities and experience life on campus! 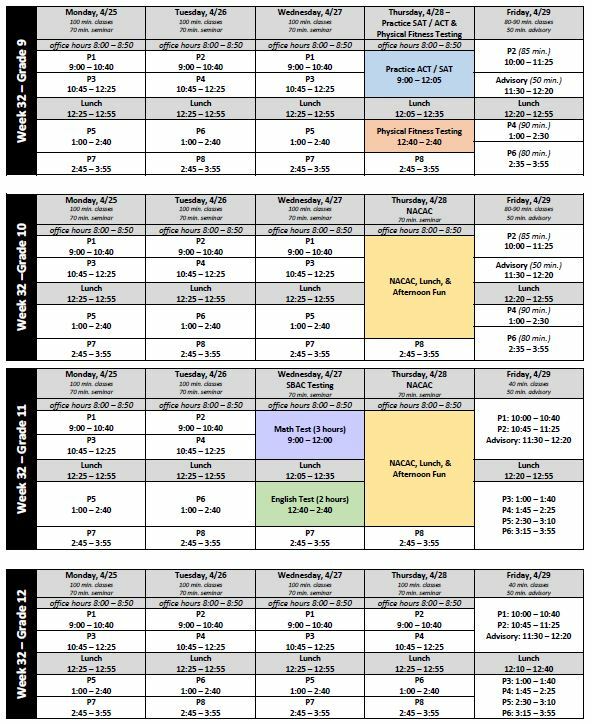 Session 1 is July 17-22 (going into 10th-11th grade) and Session 2 is July 24-29 (going into 12th grade) DVS students have attended every year for the last 3 years and have loved it, and we also have a limited number of scholarships available – but first you have to get you application in! Week 30 is DVS Spirit Week! Also, we are hosting a Red Cross blood drive on Wednesday and parents are welcome to come and participate by giving blood!